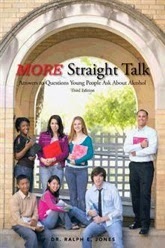 In MORE Straight Talk, Answers to Questions Young People ask about Alcohol, the author faces us with information on what continues to be one of the most pressing drug problems of our society, the consumption and abuse of alcoholic beverages. The question and answer format makes the topic easily understandable for young and old alike and the author approaches the topic from the understanding and empathic heart of a counselor. Without question, this book is a must read for anyone interested in the problems associated with alcohol abuse in our families and society. It is especially imperative for parents of young children to read this book to gain information which will enable them to answer honestly and factually their children’s questions about the use and abuse of alcohol. This book is an invaluable resource to help educators, the clergy, those engaged in substance abuse prevention and treatment, and others engaged in health care and the helping professions. “Without question, Dr. Jones’ book is a must read for anyone interested in the problems associated with alcohol abuse in our families and society. It is especially imperative for parents of Young children to read this book to gain information which will enable them to answer honestly and factually their children’s questions about the use and abuse of alcohol.” Donald E. Smith, BS, M.Ed., Ed. Dr. Ralph E. Jones retired from the U.S. Air Force after a distinguished career of 22 years. He worked in various hospital settings before retiring from the State of Texas as a Health Care Administrator, Counselor, and Psychologist for another 22 years of service. Dr. Jones received many awards, decorations, and allocades during his career; to include Counselor of the Year for the State of Texas and induction into the Hall of Fame with the Texas Association of Addiction Professionals. Included in his four degrees were studies in Anthropology, in which he had always been interested in. These studies served as a basis for fulfilling his desire to be an Avocational Archaeologist. He visited many Archaeology sites throughout the world, and explored many areas pertaining to early man in Southwest Texas. His authored books include Straight Talk: Answers to Questions Young People ask about Alcohol, and The Adventures of Kele, Boy of the Rock Shelter.